When Samantha Kidd's job at Retrofit Magazine leads her into the fashionable archives of seventies style, she's prepared to report on patchwork velvet and platform shoes, but she never expected to uncover the theft of a major collection of samples from runway shows that took place before disco died. When the guilty party threatens Samantha's family and friends, her priorities shift into protection mode. The investigation heats up faster than fondue over sterno, and all too soon Samantha learns that while beat goes on, there's no guarantee that she'll go on with it. 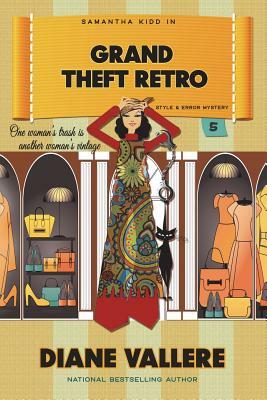 Diane Vallere is a former fashion buyer turned mystery writer, trading fashion accessories for accessories to murder. She writes the Samantha Kidd, Madison Night, Material Witness, and Costume Shop Cozy Mysteries. She started her own detective agency at age 10 and has maintained a passion for shoes, clues, and clothes ever since.